This Modern Halo Aquamarine Diamond Ring in 14K White Gold puts a contemporary twist on a design that harkens from the 1920s and semiprecious gemstone that's been gaining admirers for thousands of years. With its sleek style, thanks in part to channel-set diamonds that streamline the look of this contemporary piece, this is a ring with both a modern sense of class and timeless glamour. 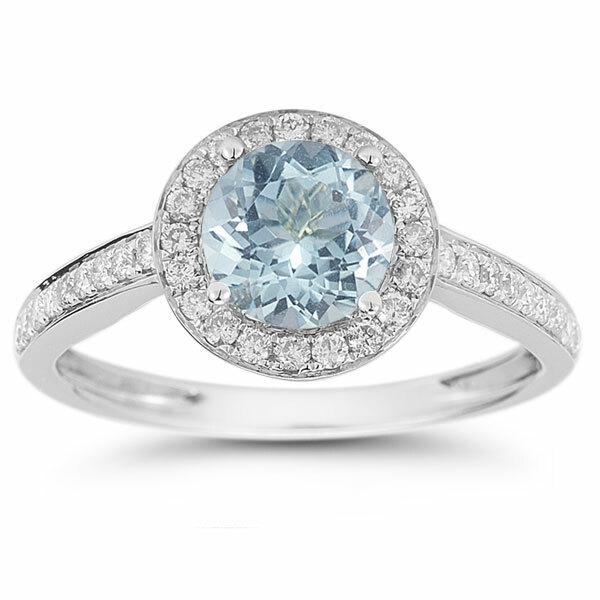 It's hard to deny the beauty of the 6mm round aquamarine that serves as this ring's center stone. The Roman philosopher Pliny once said that the aquamarine "has charms not to be denied," and over two millennia later, his words still hold very true. The name of this light blue gemstone hints toward this semiprecious gemstone's refreshing appearance: With a name that comes from two words meaning "aqua" and "sea," it's no surprise that this gem calls to mind the hue of the clearest sea, with a sparkle that glitters like sunlight reflecting on the waves. 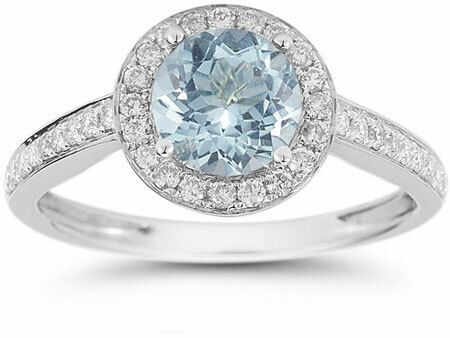 Accenting this modern halo ring's aquamarine are 38 small round channel-set diamonds, 20 of which create a glittering frame around this center gem. The rest of these dazzling gems are set into the cool, gleaming band of 14K white gold. We guarantee our Modern Halo Aquamarine Diamond Ring in 14K White Gold to be high quality, authentic jewelry, as described above.